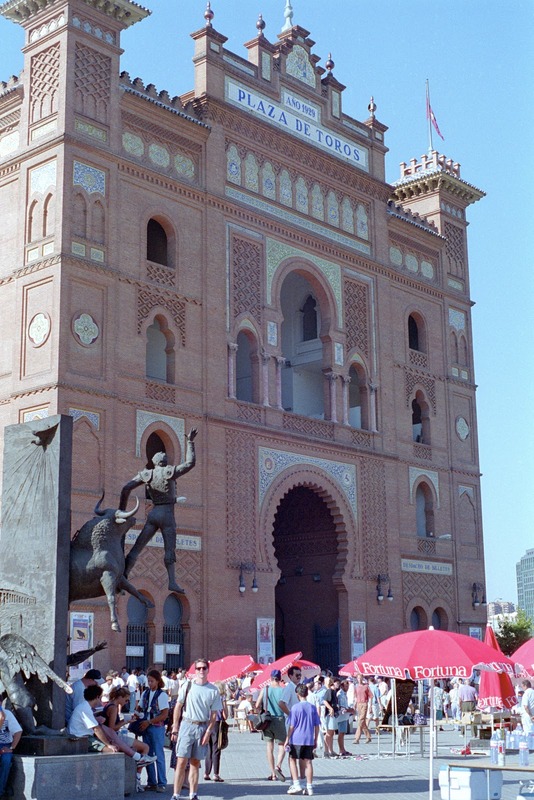 Plaza de Toros Las Ventas in Madrid. I know it's not PC, but should we take our kids to a bullfight this summer when we're in Spain? Thanks to Debbie Dubrow for hosting Photo Friday every week at DeliciousBaby.com. Yes. It's part of the culture, so why not? If they want to. Mine are too squeamish - my younger daughter would spend the entire time fussing that either the bull or the bullfighter was going to get hurt. At 4 and 6 I wouldn't take my kids. It's not really something I ever want to see either, understand or condone. But it's also part of the culture so ... With older children I would perhaps watch a film with realistic bull-fighting in it, visit a museum or two that discusses it and then see if they still want to go. As they say... When in Rome, do what the Romans do! I loved the architecture of this building. My kids were 4 and 6 when we went to Madrid and debated about it too. We ended up just admiring this building from the outside. I say if your kids are over 10 and they want to go - definitely. It would be a great experience. Good luck!